I took me a long while until I finally went to buy an iPad last week. I spent the first few days trying to find proper iPad apps, and organize them into something useful. As I only got the wifi version, I don't really use it as a portable computer, but as a content reader, and I update the content when I get a wifi signal. There are a few thoughts, in addition to the current comments on the iPad magazines being wall gardened and the new form of interactive CDROMs. I tested the device in various environments, including a couple of hours outdoors in the park, in my bed (20% of the time spent it seems), sitting in a couch at my club, etc. the screen is bright enough for reading outside, and colors are crisp; the size is slightly too small for a magazine, but the zooming is OK. However when you display 2 pages (as when you open a magazine), then the screen is too small. donwloading of a new issue of a magazine does take a while (300MB to 2GB !!! ), and connecting it to iTunes should only be done at night as the backup takes forever; prices of magazines is about what you'd pay at a newstand, so I guess it's a non issue. However there seems to be subscription services to magazines that offer a whole year subscription price (and you get a PDF) for less than the single issue price for a magazine). smart apps even display an arrow on each page to tell you which way to swipe. it should be subtle but present. I really like the double layout (horizontal and vertical) for most magazines. Nevertheless it's a bit annoying when you get more content (larger picture) on oen direction without warning. I just don't want to be moving my iPad sideways all the time. There should be a notification somewhere. Apps that are mere PDFs on the iPad represent little interest (OK, it's great to have them), but addition of interactive stuff makes them great: videos, choices, etc. Wired does a good job at that with multiple selections on one page (yes it feels a bit like interactive CD-ROMs). The New Yorker for example has a section called "this just in" that updates automatically like a twitter feed. Smart. social media: I have yet to see an app that adds a twitter / facebook / addthis button to EACH article, or even to Instapaper. This should not only make the app as social as a website today, but also drive sales up for people not reading that app. web sites use technology to speak articles aloud. I have yet to see this on the iPad. Wired has some voice interviews (dull). Gourmet is testing a reather interesting idea : you can unlock content (just like in games) by gaining "experience points" (just like in games) by reading more articles, and interacting with it. I like the idea, but I'm not sure it will hold, unless the issues is free or very cheap. Ad supported b-model is fine for this (watch an add, grab XP...). Many of the ads I read, have little interactivity (a few extra pictures, a video). Some don't even include a link to their own website. There's a huge opportunity here to create "ad mini-sites", with videos, 3D models, a configurators (for cars), links to local retailers (based on GPS), best prices (in the neighborhood), etc. The iPad is a really very high engagement device, and advertisers are just plain dumb not to use it. Any product advertised or displayed should have a link to a whole range of ecommerce options such as what gdgt.com is trying to do for tech (price comparison, forums, reviews), including secondary transactions. For example, Food & Wine talk about recipes : it's a great way to sell a whole shopping basket in one go (a bit like what macperformanceguide.com does over and over again for spare parts on Mac). There's also an issue with DRM : when I buy a print magazine, I can share it with my family and friends at home, as it sits on the coffee table. Eventually my family will probably have several iPads. I need to be able to declare a group of "iPads" (up to 5 is probably fine) so that I can share an issue with a member of the family (OK if only one of us can read it at a time), and a mechanism to give the digital copy to someone as I would with a paper magazine. In terms of opportunities : it seems to me that most magazines are outsourced to creative agencies so far; why not. But with the advent of connected TVs (and the existance of web and mobile sites), there is definitively a need for a full suite of authoring tools including touch devices that will make an iPad just one of the screens of a digital strategy, from the same original content. I don't believe there's such a tool available yet, but it would definitively help keep the skills required for digital magazines inhouse. Last december (2009), I was fortunate enough to attend a small conference in London, Noah Conference, focused on Internet-related growth companies. It was a real breeze of air, with companies in "boring" sectors, doing fantastically well, with clear business models and execution. Many of them really impressed me, reinventing how to sell tires online, gold online, downloads, etc. In these days of the World Cup, I'll just mention Kentara / Perform's campaign to bring online the 1st and largest pay per view live streaming of a UK football match. All major TVs refused it (although they felt it could target 8-10m unique viewers), so they went themselved and marketed it as www.UkraineVEngland.com. 11th hour deal with the BBC for highlights, etc. They did not give financials onstage, but with prices at £4.99, £9.99 and £11.99 pounds, including free streaming to armed forces and bet365 new sign-ups, we can guesstimate a 6-8 pounds average income per user ? Multiply that by the close to 600K users who watched it eventually, the operation brought in £3.6m-£4.8m on this operation. Not bad for one operation, that could be repeated regularly. That said, I'm going back to Noah this year for inspiring speeches by successful entrepreneurs. noos.fr : a case study on how to loose a customer. I've been a customer of Noos (also called now Numericable, a French cable ISP and TV provider) since 1994 (16 years), although I canceled the ISP part a long while ago, because it was definitively sub-par. I kept my Noos subscription for my bedroom with a second TV. It was a 4:3 image in SD, cropped on the sides of my 16:9 TV. When I finally decided many months ago to set up a power line internet with a 2nd STB from free, I got immediately a 16:9 HD image ! (I had never bothered to check before, because I have an old and small CRT in the living room, definitively not HD-ready, and the big HD TV was for gaming, VOD and DVDs). Switching between the two set top boxes on this big TV became annoying (4:3 cropped image in SD vs. 16:9 HD …), and I started investigating why, as it definitively makes a difference during this world cup. Was it a connectivity problem with a faulty cable? a wrong setup somewhere ? Eventually I called Noos' hotline today (had to dig through old papers to find my customer number; and of course impossible to remember my customer password online). * when I asked about the 4:3 cropped image, they said, well, that's because you don't have an HD box. (aaah! …). "but you can upgrade it at any Noos retail store for 70 euros !" (they never offered me before an upgrade by email...). We had to change the box though a few months ago only because it just died of long life... I would have expected them to send me a recent box no ? * so then I ask to cancel my account. 5 min to transfer me … boring music… : a new guy comes up, and says, well, we're happy to OFFER a new HD box to you (-70 eur ! ), delivered to your home (nice), and 12 months box rental for free ! (12x5 = 60 eur). Nice touch. But he adds, in order to get HD channels, you need a *new* bundle of HD channels (yeah! I was on an *old* bundle), that will cost 29eur (and something), instead of the 26eur I pay now, but they are glad to put it in for me at about 24 eur a month (that's another 5x12 eur = 60 eurs). nice. to get the HD channels, I need to accept a 12 months renewal engagement . 1) just because I want to cancel my subscription, they offer me a new box, discounts, etc. (if you're into this sort of things, you should definitively try canceling to get these promotions !). I expected to be treated the same way without asking. Being rewarded for being a loyal customer. Just the way Free does it ! 2) I can't believe they asked me to sign again for 12 months more when I'm telling them I'm unhappy they didn't offer me this before and that I had to ask for an upgrade (the guy's answer : "oh, we're doing a campaign right now to inform our customers…" yeah right). step 1: offer me all of that, and not ask me to re-sign for 12 months. What are the chances I'll cancel after being a customer for 16 years ? 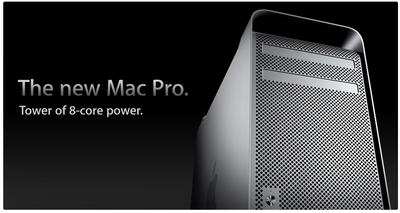 step 2: upgrade me automatically or at least inform me regularly in the future. Bottom line, after posting this, I'm posting my subscription cancellation letter. - 40 EUROS cancellation fee ! (and the guy tells me, but you've left twice 66 euros deposit for the boxes… so we'll take it from there). Hey Free, when are you bringing fiber to my neighborhood :D ? 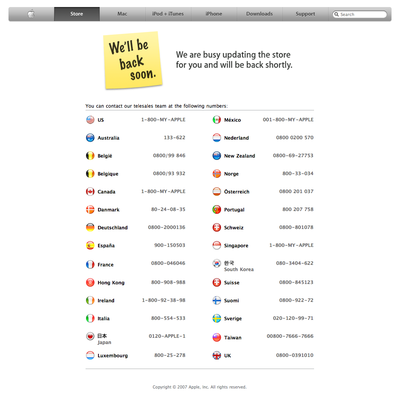 The Apple Store is down... what's coming up ? Lovely Catherine Barba has just (exactly 27 minutes ago) launched a rband new version of her online cashback service, cashstore.fr (at last !!!). The alarm:clock euro broke the news last night. In this little video I had a chat as back as early may with Spreadshirt's founder & CEO about this deal :) Published here with his permission. You'll see how he launched this company to compete with the american giants back in 2002, and the impressive numbers today: over 200 employees, 200.000 online shops, a dozen countries. I had an earlier interview with him here. update: and congrats on buying La Fraise, THE community T-shirt company in France. I'm just saddened that Patrice would not want to give it a try and keep running the company for a while ? Dudes! Get a DELL guy to optimize your online AppleStore !